The student offered Grimes another banana, and Grimes took it again. 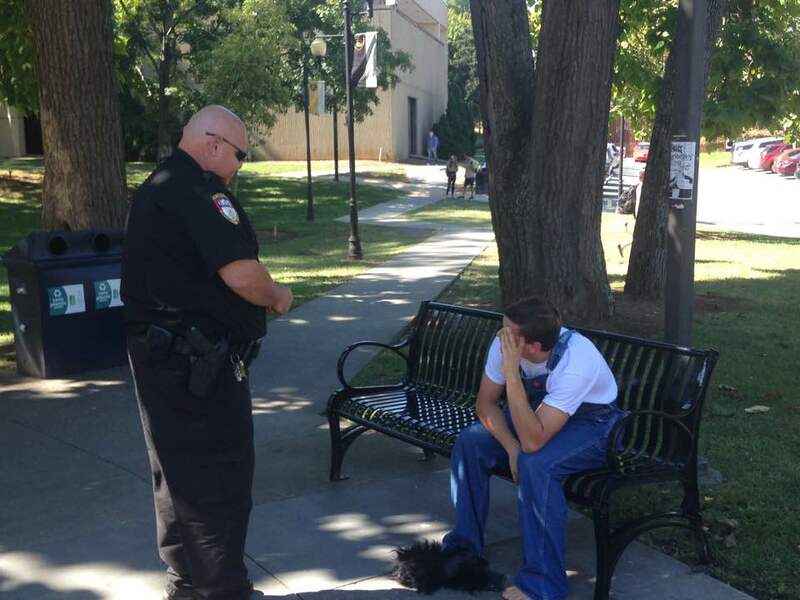 Eventually, officers with ETSU Public Safety escorted the man in the gorilla mask away from the plaza. 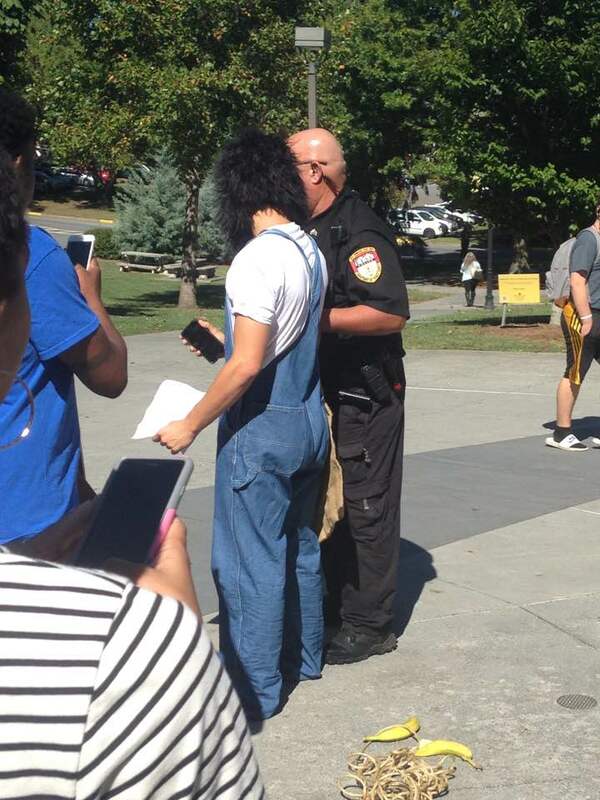 The freshman student has been identified as Tristan Rettke, who has been charged with a count of civil rights intimidation. Aside from the rope and the bananas, Rettke also had a burlap sack that had a marijuana leaf and a Confederate Flag printed on it. The demonstrators were in the plaza as part of a three-day series of demonstrations that were organized in protest of the recent shootings by police of black men in Tulsa and Charlotte. On Wednesday afternoon, the office of the president released a statement responding to the incident. “We are exceptionally proud of the students who were peacefully participating in the event and the manner in which they exercised restraint, thoughtfulness and strength in the face of inappropriate and offensive behavior,” the statement said. The email said that criminal charges are pending before the local district attorney, and the university has begun a student-conduct investigation. University leadership quickly organized a community meeting tonight Wednesday night in the D.P. Culp University Center Auditorium. During the demonstration on Wednesday, protestors linked arms and held up mirrors emblazoned with the names of victims of police violence, hoping that passerby would take the time to see themselves in the faces of those victims. 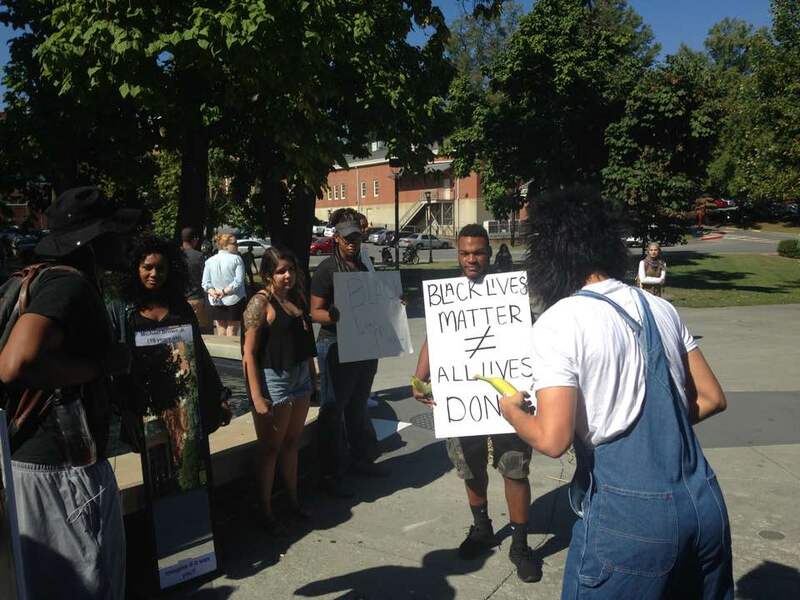 The demonstrations were held from 11 a.m. to 1 p.m. Tuesday and Wednesday in Borchuck Plaza. Another protest is planned for Thursday at the same time. On Tuesday, students gathered around the fountain in a symbolic protest, Farnor said, against the silence that has been forced on the black community. During the demonstration on Thursday, protestors will wear white T-shirts personalized with their names hashtagged (for example, #NathanFarnor). 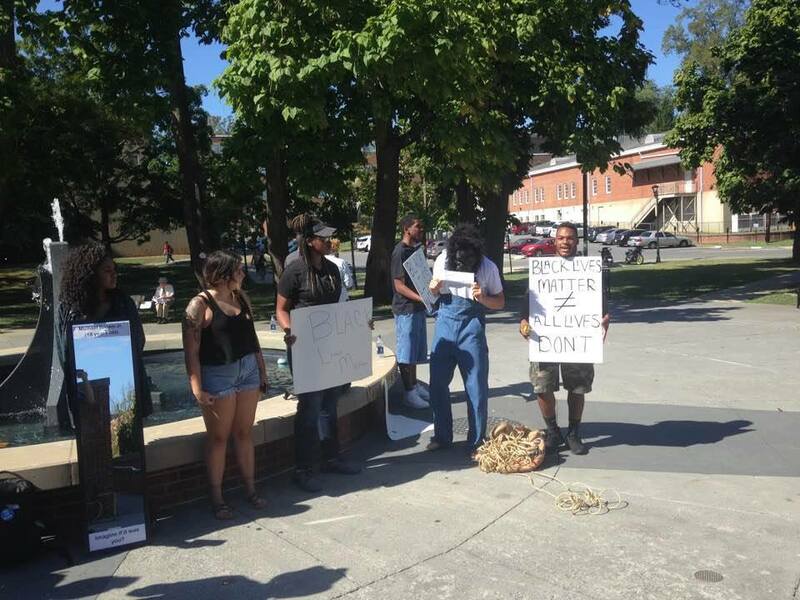 Despite the controversy caused by the protestor’s appearance, his presence did seem to attract a larger crowd, and Grimes said that his arrival was a good thing. During the community meeting in the D.P. 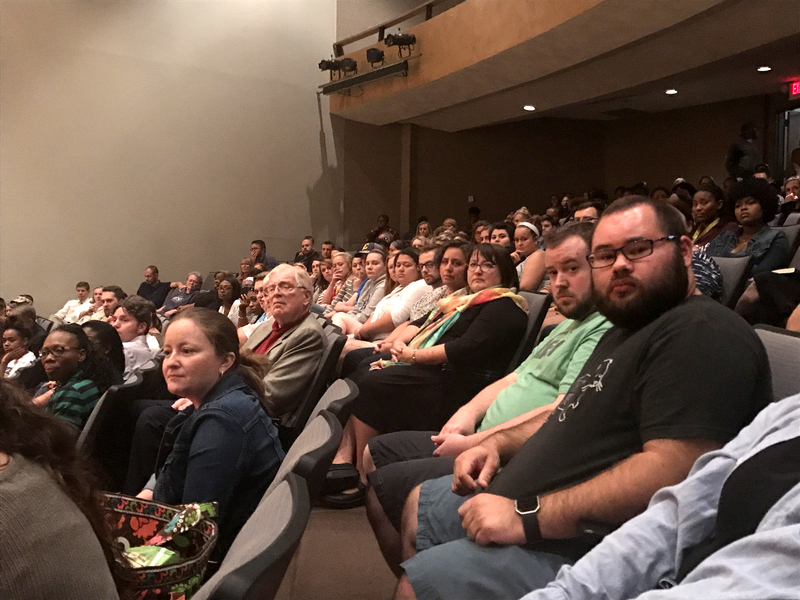 Culp University Center Auditorium, ETSU President Brian Noland and other administrators spoke to students about the events in Borchuck Plaza. 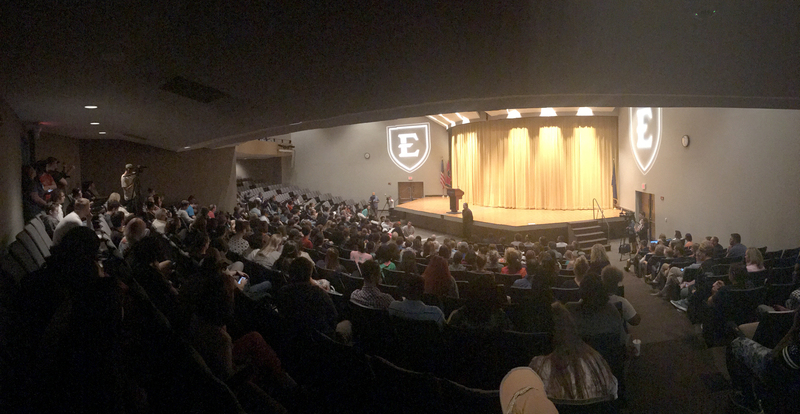 ETSU professor Chris Dula served as the moderator, and encouraged participants to ask questions and to discuss the incident on campus today. 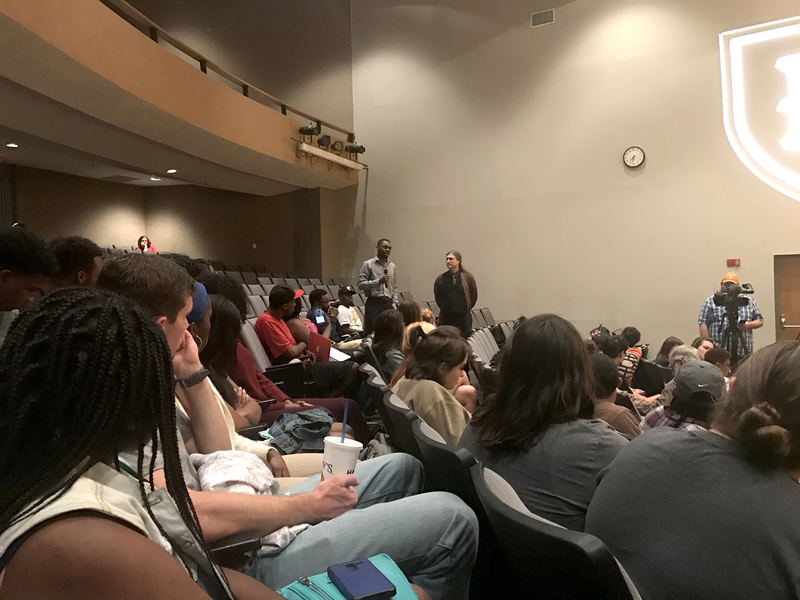 Many of the students shared concerns about what they said were administration’s lack of response to smaller incidences of racism, such as micro-aggressions, in the classroom. Noland and Dula have been working with other faculty and staff for the past nine months to ensure a safe and diverse campus; this served as a reminder to why these conversations are necessary. A student questioned what would set this plan apart, and Noland addressed the community. There will be plans put into place, attached to resources, with measurable outcomes implemented. Noland invited the community into his office hours, to further discuss these plans. This rare dialogue has brought conversations that this university has never seen before, and the reaction has been positive. Sophomore Jeremiah Pearson delivered a personal narrative, which challenged attendees to think about why black skin has a stigma attached and the stereotypes black people are held to. Despite their anger and distress, protesters remained calm, many citing the stereotype of the angry black woman or the angry black man as their reasoning. 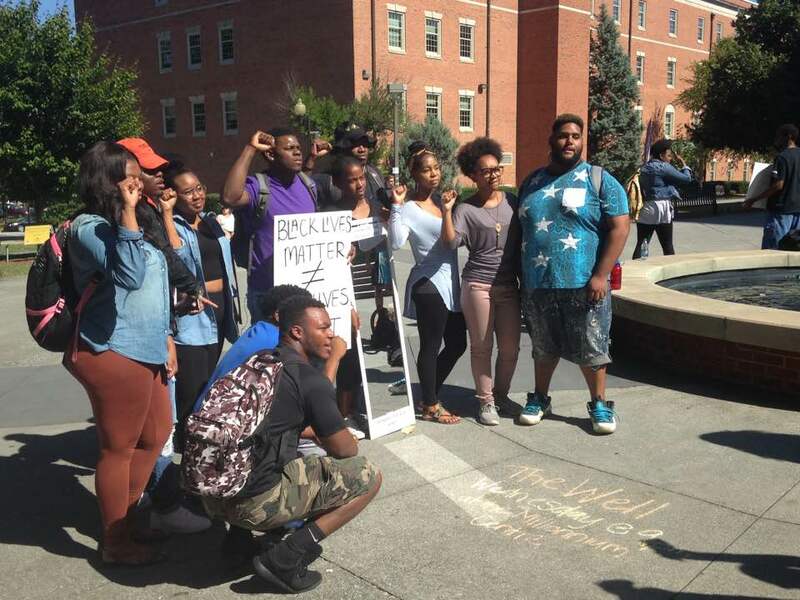 Pearson spoke on behalf of many of the minority students at ETSU. General-Assignment Reporter Alexia Stewart contributed to this story.